Tater tots are a relic from my childhood. These are crispy little crispy potato nuggets that were sold by Ore-Ida, frozen in bags and ready to be refried or baked. Somehow these remind me of many moments in front of the TV watching batman cartoons and reruns of Charlie’s Angels. 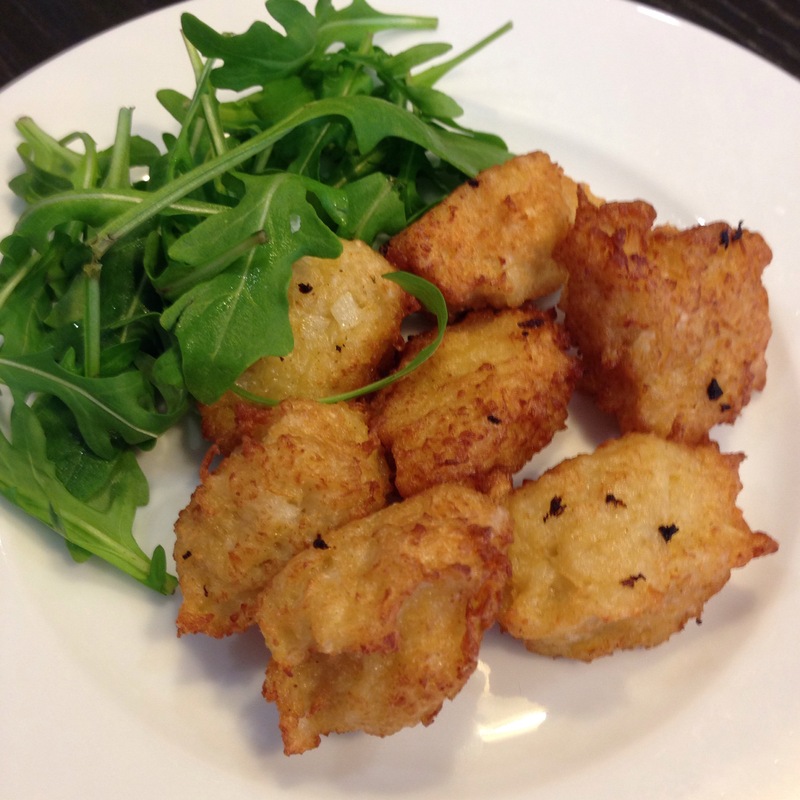 This was a mini-experiment to make a low carb tater-tot. In the end they ended up being more like cauliflower croquettes than tater tots but at the end of the day I wasn’t too unhappy – what’s not to like about fried, right? Steam the cauliflower whole for 18-20 minutes. Cut the cauliflower into florets and using a food processor, coarsest grate to rice-like size. Line a sieve with kitchen towels and layer some grated cauliflower over the towels, and lay a few layers of towels over the top of the cauliflower. Using your hands, squeeze out the excess fluid from the cauliflower. Repeat again, changing the kitchen towels when soaked. Add the salt, pepper, paprika and cayenne paper to the cauliflower. Mix in the beaten egg and arrowroot flour. 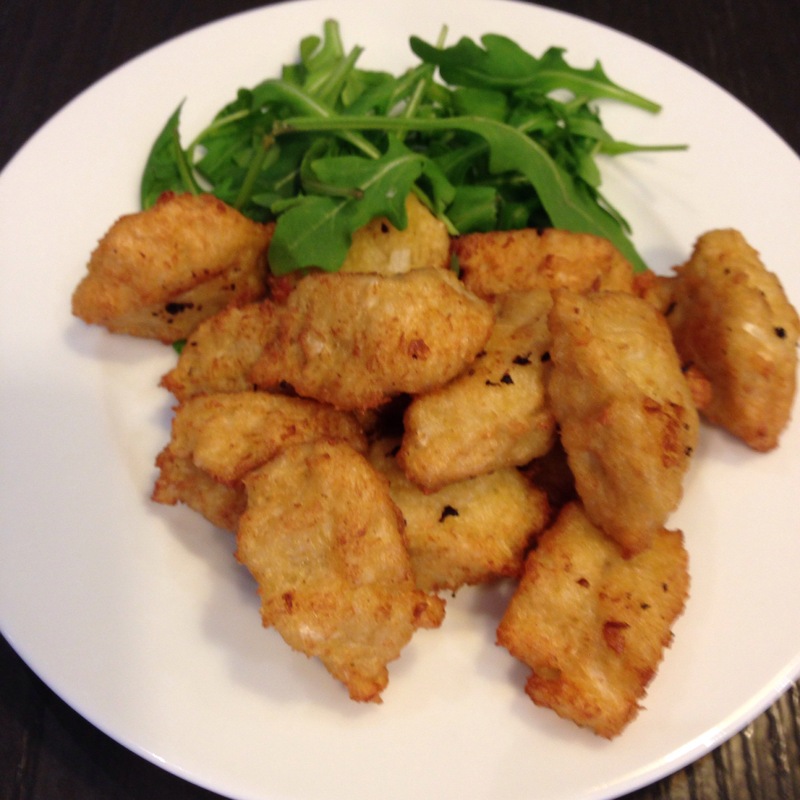 Shape the cauliflower mix into thumb shaped tots and lay out on a pan. Heat up the oil in a wok over medium flame. Carefully slide in the cauliflower tots. Fry about 1-2 minutes per side till golden brown. Drain on more kitchen towels. Serve hot with low sugar ketchup. Misshapen and not quite tot-like but still passable in flavour.